Feel the dark magic of voodoo culture and get poked by some of amazing rewards while playing Voodoo Vibes slot. Published by the well-known software developing company NetEnt, this slot is coming with interesting design and involves all the elements from the voodoo culture. The theme and interface are made according to that, but instead of dark colors which one would expect, the graphics are made in a cartoonish way to make everything more cheerful. So, there is nothing to be scared of as you are not going to catch some dark magic, and the only thing that you are gonna catch, are great rewards. 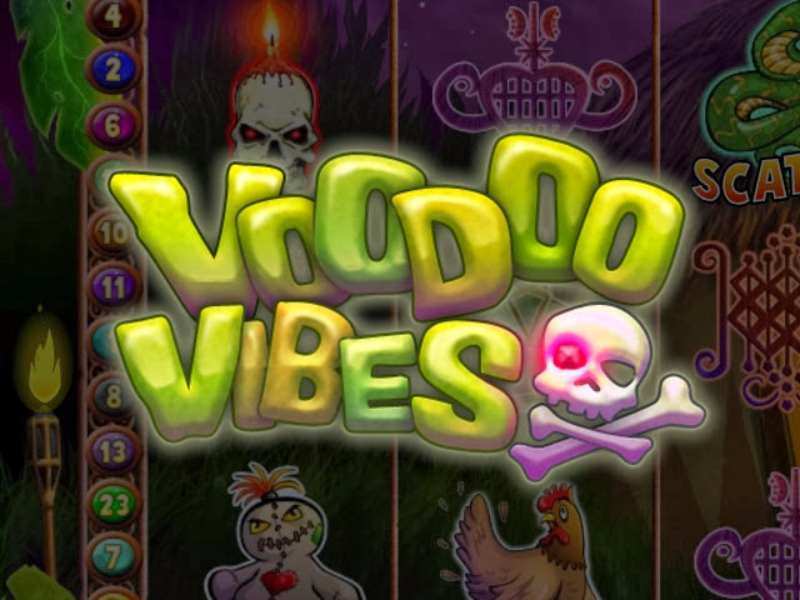 Voodoo Vibes is 5 reels and has 25 ways to pay out the player’s winnings. It can be accessed online across all kinds of platforms such as desktop or mobile ones, and the only thing that it requires is Java Flash Player Installed and running. Besides free gaming, this slot is also available for real gambling across couple of online casinos which can be reached from bigger part of Europe (UK, Sweden, Norway, etc..), America, Australia. The magic of the Voodoo Vibes online hides in bonus levels and special effects of symbols involved. Besides them, the regular game revolves around pure luck and is played with regular symbols presented as objects from the voodoo culture. The winnings as in other slots are paid from left to the right, and only the highest win per bet line is being paid out. All of the ordinary symbols are divided from each other by values and images. The most valuable one is a creepy skull with maximum worth of 500 credits (if 5 of them are landed). The skull is followed in descendant order by all the other regular symbols such as voodoo women, chicken and voodoo relics. The real magic as already said, hides in special section of cards involved in the game. It contains wild, scatter and bonus cards. The wild card is presented as a magician with an ace on his hat. Don’t be afraid to come across him as he has the effect to substitute for any other ordinary symbol in order of achieving winning combination. This effect doesn’t work on scatter and bonus cards only. Besides his magic effect, this card brings big amount of money. By landing 5 of them on the reels, the gambler receives 7500 credits! The Voodoo Vibes slot’s scatter card is the second most powerful one and is presented as a green snake. It can land anywhere on the reels and it brings different rewards depending on the number of scatter cards on the table. During free spin feature all of the wins are multiplied by 3! Bonus symbol presented as voodoo doll is the most valuable one as it unlocks the bonus level by landing 3 or more of this kind anywhere on the reels. Prepare to cast some voodoo magic and maybe with enough luck hit the jackpot with this bonus level involved. Of course you don’t have to be a magician or magic practitioner at all. You are automatically transferred to the scene where voodoo dolls are placed on the shell. Just poke the right ones, and win up to 250 coins with only one click. The game ends when you poke the doll without a prize. When this happens all of the dolls open up, showing all the coins you could have won. The betting on this slot is optimized to suit everyone’s taste. It contains 4 betting levels and gamblers can choose the number of betting lines from 1 to 25. The minimum amount of coins that can be placed in a single spin is one penny, up to the maximum of 50 credits. Besides that, the game is listed among the slots with average return to player percentage, making your winnings more often. The Voodoo Vibe slot is 5 reels 25 paylines and perfect choice for any lover of dark magic and voodoo culture made with classical NetEnt design. All of the power is yours and all you have to do is use all the elements involved. In order of experiencing the real feeling of casting a magic, the gameplay involves bonus level where you poke voodoo dolls, but instead of making anyone suffer, this way you are getting closer to the jackpot with all the rewards won. For everyone searching for similar slot action and design, we recommend trying out Day of the Dead slot which is featuring cartoonish spooky characters. To learn more about the voodoo culture all you have to do is to start your browser, search, and play free Voodoo Vibes casino slot machine online without the requirements of downloading and registration. 0 responses to "Voodoo Vibes Slot"